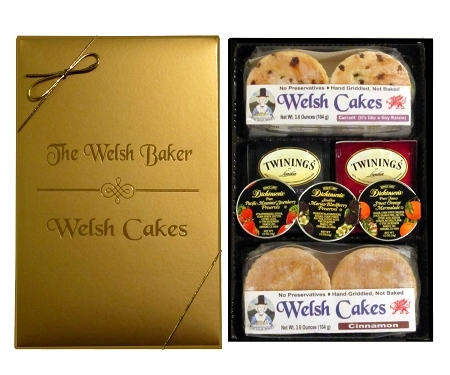 Two Packs of Cakes, Preserves and Tea Gift Box - Yum! A delightful and affordable gift option in an elegant gold printed gift box enclosed with a gold ribbon as shown. This Gift Option contains two packages of any flavor we make - each package contains 4 items so you get 8 yummies in all. You also get an assortment of 2 Twinings Teas and an assortment of 3 Dickinsons preserves. This assortment is perfect for an afternoon tea with friends! Go ahead and make their day with a gift they will not expect and one you can be sure nobody else will duplicate. This is a gift they will always remember. ►Gift Messages, Shipping Address and Delayed Delivery Date is specified at check out. Worried about your gift arriving on time? We are too! That's why we will do everything within our power to ensure your gift arrives when you want it to, but we cannot control everything and so it's best you understand how our shipping works. We ship from California using USPS Priority Mail. Under normal conditions, delivery is 2-3 business days to Mid-US and East-US, 1-2 days to Western US. For Christmas Orders, the USPS advises it is best to order by Dec 19 to ensure delivery by Christmas Day. From our experience we know that some Western US destinations may arrive by Dec 25 even if ordered after Dec 19 but neither we nor the USPS will guarantee it. Ordering early and requesting a delayed delivery date is your best bet for time sensitive deliveries. Copyright The Welsh Baker. All Rights Reserved. eCommerce Software by 3dcart.